Charlotte has given her permission for me to blog about a poem she wrote whilst out with her mother. The reason I asked to blog about Charlotte and bring her poem to you is very simple. This is what 8 year-olds should have the opportunity to do. All 8 year-olds should be able to go on outings and let their imaginations go free. They should have the chance to enjoy childhood but at the same time develop their talents and grow their ambitions. 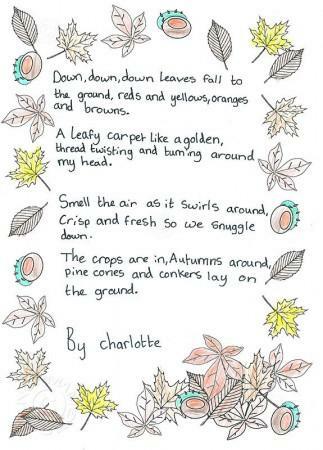 In this case, Charlotte wrote a poem about Autumn. This poem is tremendous! Please read it out loud and you will see how Charlotte has a real talent with words. Donate to a valid children’s charity of your choice. It is easy to do – online, collection boxes, Give as You Earn. Any amount is important and I am delighted for one pound, dollar, euro, yen to reach a charity. I blog to get people to donate to kid’s charities. I want people to make a donation then write to me by commenting on the blog. Please read the ‘About Lesley’ section of the blog to find out why I do this; the Comments and Running Totals pages to see how far we have come…. Tonight a post from me to you all out there but the words will not be mine! A new comment was added to the blog today from the lovely @br007kbond on Twitter, real name Trevor. Trevor wrote a poem for the blog and it is wonderful. I wanted to make sure that everyone could see it so I thought it should become a blogpost. When I was eight, my life was great! I would dance and sing and play. Sleep in peace all night to wake to another great day. So much horror and pain, not (possibly) for me and you. And remember when I was like them, but I could just laugh and play! As we grow old we learn that life is for the living. It can be cruel and hateful and very unforgiving. For mother nature, whilst pure, can sometimes be unkind. And often there are glimpses of places dark and dank and smelly. By giving on this blog we can rid them of those places!